If you’re in the market for a new smartphone, chances are you’ve been glued to your computer, digging through the endless articles that have popped up since earlier this week when Samsung announced their new Galaxy S5. Since we at Speck are machine lovers just like you, we’re happy to share our comparison recap of both the Samsung Galaxy S4 and the newly announced, Samsung Galaxy S5. With its new price point (among other comparable features), many Samsung fans will use this opportunity to take advantage of all that the S4 has to offer or put on an early adopter hat and get the new S5. 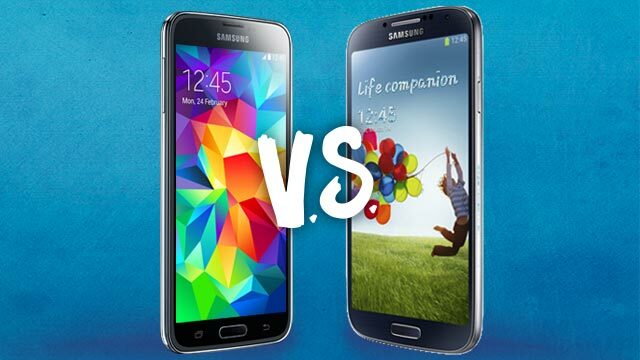 Whichever one you end up choosing, Samsung has aced the smartphone category with these two devices. Size. The Galaxy S5 has expanded its screen just 0.1” larger than its predecessor (with the same 1080p resolution), and the phone itself comes slightly thicker, too. Weight. Unlike many smartphone manufacturers, Samsung’s created their Galaxy S5 to be 12% heavier than the S4. Material. Both phones feature a similar backing, with the new S5 doting raised dimples that Gizmag calls “the closest a phone has ever gotten to my grandmother’s living room upholstery, circa 1979.” Hey, maybe that’s your thing! Tech specs. The S5 is slightly faster, holds battery life longer, and the camera’s upgraded to a higher resolution for photo & video. However, the RAM of both devices are the same while the S5 has slightly less storage than the S4. Fingerprint scanner, heart rate monitor, and water resistance. The new Galaxy S5 has it, the S4 doesn’t. Consider these the most sought-after features from consumers who’ve got to have the latest & greatest smartphone technology. But PG Mag has its own opinions about whether these are worth the switch. If the HTC One is among your top smartphone considerations, check out Digital Trends’ comparison of it and the new Samsung device (then again, HTC fans may already know there’s talking of a newer HTC One model in the near future- if that’s the case, it may be best to wait this one out). Sold for one of the Samsung phones as your next pocket machine? Check out Speck’s latest mighty slim protective cases for the new Samsung Galaxy S5 and the equally protective cases for Samsung Galaxy S4.